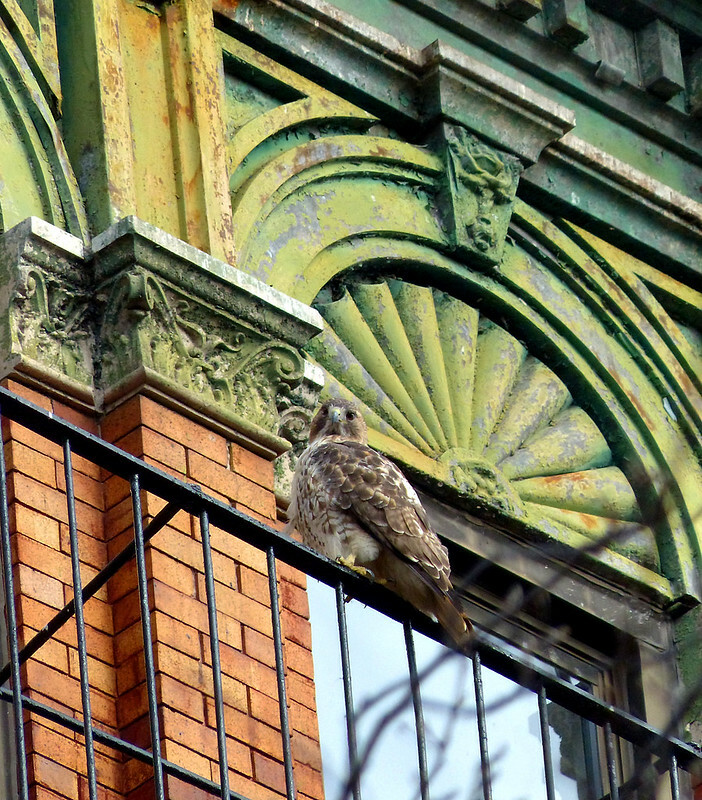 The last few days have seen an extravaganza of hawks in and around Tompkins Square Park. As far as I can tell, I think I've seen seven different red-tails. Thanksgiving morning, this juvenile checked out the offerings in the SW corner of the park. The following day, this adult caught a mouse. 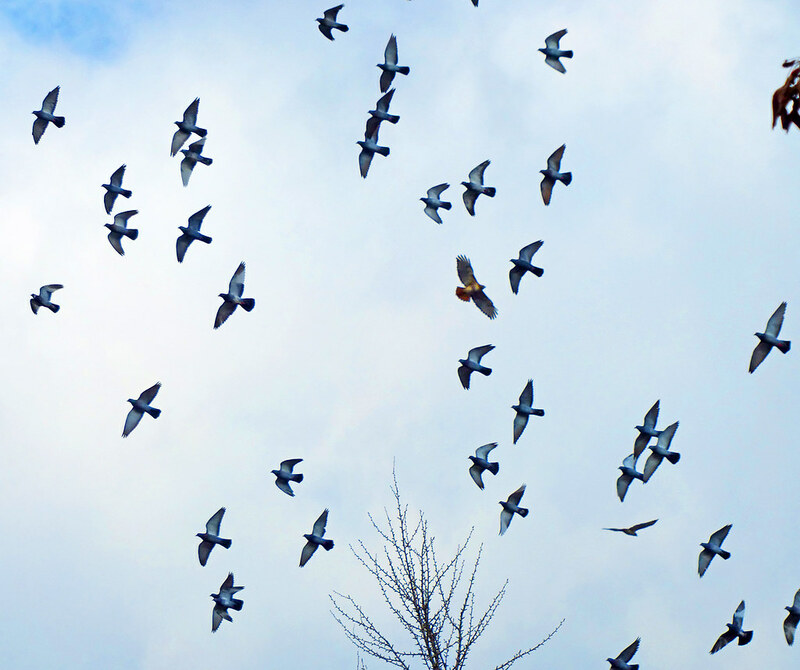 Can you spot the two pigeon impostors? ...collided with the glass bus stop on Avenue A at 9th Street. You can see video of the aftermath here. The stunned hawk stayed on the ground for about 15 minutes before being able to fly up into a tree. It then stayed there for at least two hours until it eventually flew off and was able to catch some dinner. 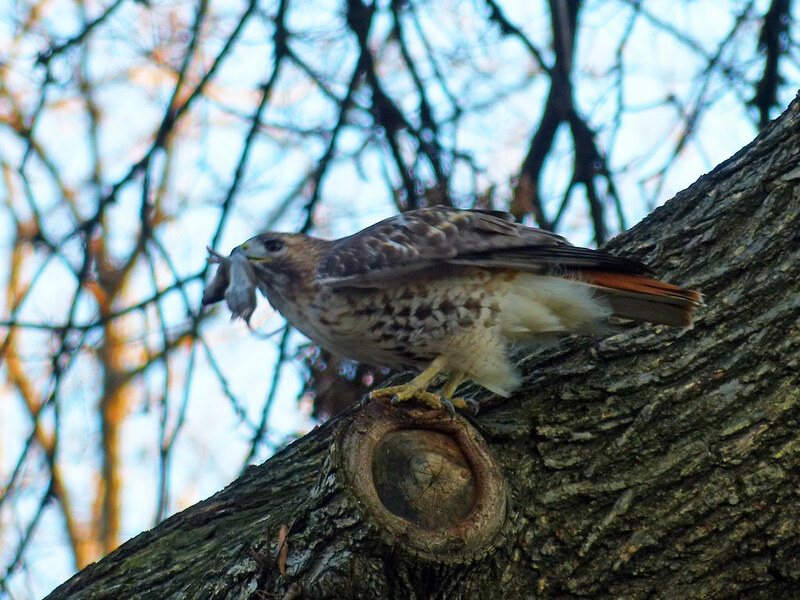 We suspect this hawk already has a foot injury. Sunday was a less traumatic day with a lot of lounging around on fire escapes. The adult above can be seen in this video 'talking' with a juvenile. There was speculation that the juvenile is the same bird who hit the bus stop, but I'm really not sure. 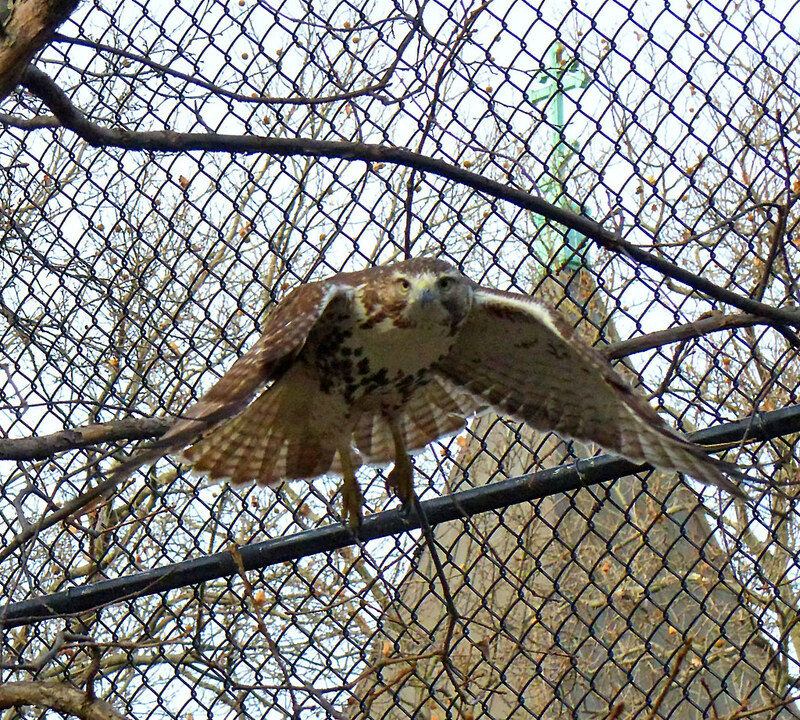 And, finally, I can't get over the nerve of the park squirrels who seem to have no fear of these hawks. I was hoping to have an update on the hawk with the beak injury, but I've not seen this bird in the last few days. 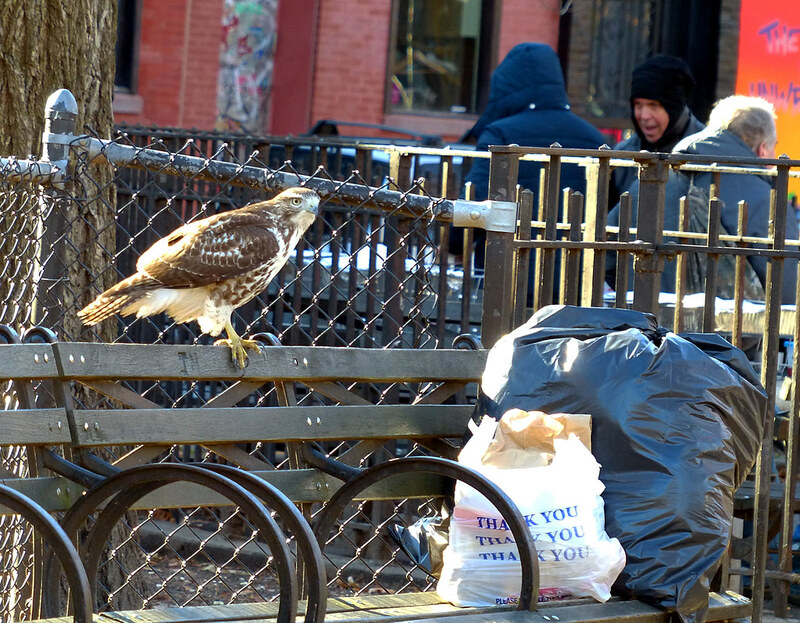 You and Roger Paw have the Tompkins and Washington Square Park hawk beats well covered. Great photographs, especially the one with the mouse! Thanks! I've been spending nearly all my non-work time in Tompkins with the birds. They really are fascinating, and amazing to watch do their thing right here among so many people. It breaks my heart, though, to see them get hurt. 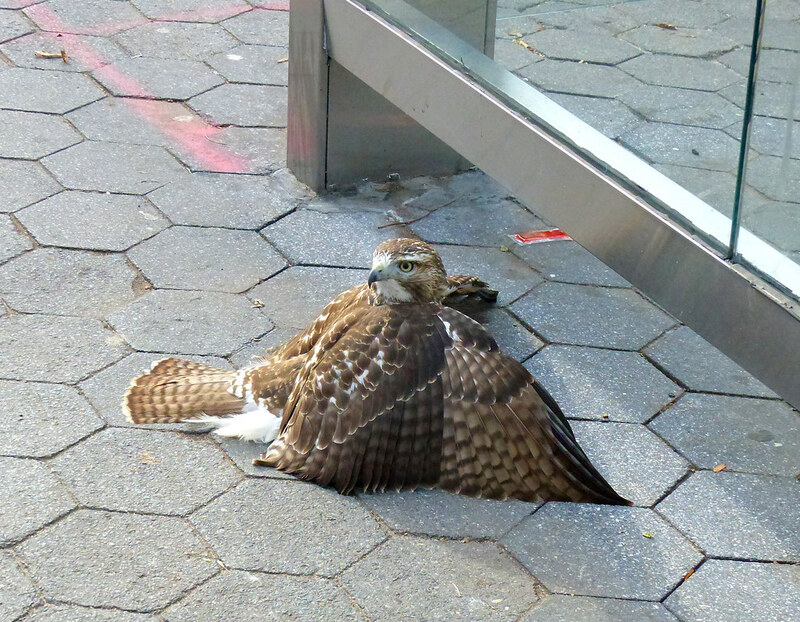 When that hawk hit the bus stop, it was just awful....but also reassuring to witness so many respectful people.